Do You Need a Relational Data Warehouse? Are you looking to do a major update to your data warehouse or looking to modernize? Many technologies have come about that are changing the landscape of what data warehouses are made of. In this Azure Every Day session, I’d like to talk about 3 new technologies in Azure and HDInsight that break the rules. You don’t have to use SSIS to get ETL into your big data storage. HDInsight with Spark can give us ETL, as well as bring to light a lot of machine learning and other technologies, so we no longer have a dependency on SSIS. Earlier this year, Microsoft released Azure Databricks which improves of what is in HDInsight with expanded Spark capabilities. This is a great place to store your data, and no, it won’t cost you a lot of money and it’s not hard to work with. Azure Data Lake gives you the ability to store all your data, regardless of where it comes from or how it looks, in that space – including real time data. Have you ever considered putting real time data into your data warehouse? Streaming data into your data warehouse would break everything we consider conventional. So, don’t put it in a data warehouse, move it into a Hadoop structure in Azure Data Lake, and avoid the issue in a structured data warehouse of: I got it in there, how do I get it out? The everyday report writers and users are not going to learn how to do map reduce or all those other technologies that make us the cool big data/data science people. These users just need to build a report. These technologies bring us to a place where we can write SQL against those data structures and not care where the data came from, how it got there, or the type of data format it’s in. We apply the schema after the fact and it means the same data that we put in our data lake, can be used in multiple scenarios. I spoke at Visual Studio Live in Vegas on two topics. While the presentations have been uploaded to the site and were available for attendees, the code was not distributed yet as an oversight on my part. In this post, I will do a quick summary of the sessions and make sample code available. I will be writing more on these topics throughout the year and will tag VS Live in the notices. With all of this support, JSON is not a native data type in SQL Server like XML. You can download supporting files and code here. During this session I went through the process of setting up HDInsight and loading data into the cluster. Once created, Hive tables were created and queries created that were used with Power BI to analyze the results. With the rise of HDInsight and other Hadoop based tools, it is valuable to understand how Power BI can help you take advantage of those big data investments. If you need to set up a cluster to work with, check out my previous posts on Setting Up an HDInsight Cluster and Loading Data Into Your New HDInsight Cluster. These posts show how to do this with no scripting required. If you prefer to script, there are a number of resources with sample scripts on doing the same work. These posts walk through the process of creating a cluster and loading up data. 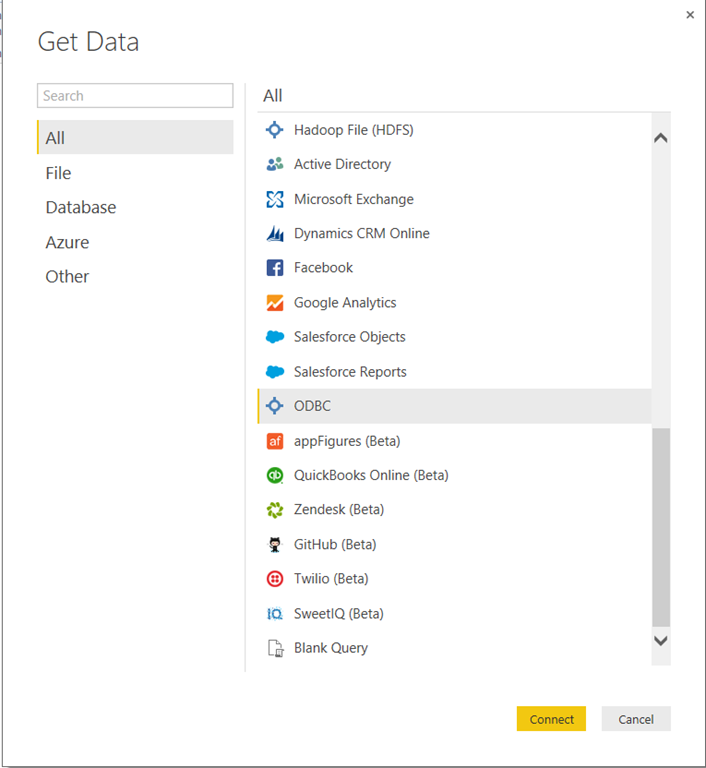 Before you can connect using a Hive query you need to download the Hive ODBC Hive from Microsoft. You can find the driver here: http://www.microsoft.com/en-us/download/details.aspx?id=40886. Once you have the driver installed, the connection can be created. Click Connect to start the process. This is the Authentication Mechanism which is Windows Azure HDInsight Service. Enter the connection string into the dialog and then you will be prompted for credentials. Use the Database option and set the Username and Password. Then click Connect. In my case, I see three tables in the resultset including the sample table. We have connected to our HDInsight cluster using Hive. So, getting a list of tables is not really helpful. As you can see, this is the Power Query portion of the Power BI Desktop. Let’s add a HiveQL statement to return only our sales data. In Applied Steps, click the gear next to Source. This will reopen the From ODBC dialog. Expand the SQL Statement portion and add a SELECT * FROM yourtable to get our desired result set. Click Ok and check the results again. You should see the tablename.fieldname format for column headers. At this point, you can proceed with more data shaping and prep data for other analytics. Click Close and Load when you are done and it will load the data into the Power Pivot designer in Power BI desktop. 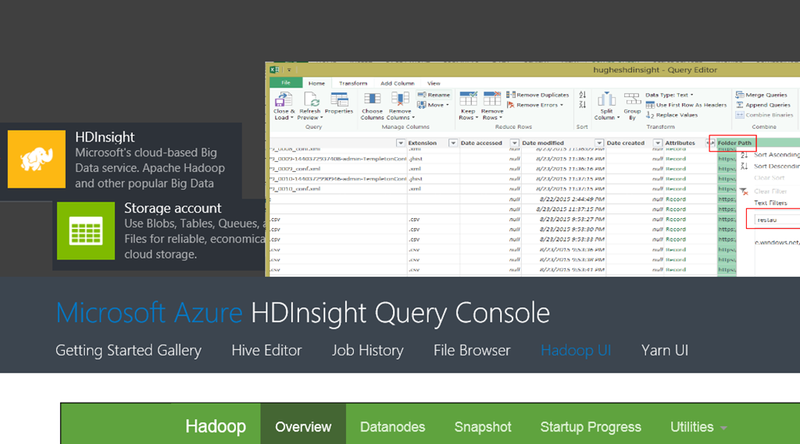 I hope you enjoyed this series through HDInsight and Power BI. It was a great learning experience for me.